toiletries | Childhood Memories of growing up in the 1950s and 1960s. I have talked about lost and forgotten shops and brands before but there are so many I thought I would revisit. My first one is Gordon Moore’s Cosmetic toothpaste. It was heavily advertised on Radio Luxembourg (also a disappeared brand!). I was a teenager desperate to try it out as it was meant to make your teeth look dazzling white. When I eventually had enough pocket money for it, and was in a bigger town where it was actually stocked, I bought some. What a disappointment! It was a toothpaste with a red dye in it. The idea was that by darkening the colour of your gums it would show your teeth as extra white in contrast. Did it work? No! I had hideous red gums and my teeth looked less white rather than more white. Sno Mist deodorant was also advertised on Radio Luxembourg – I could sing the jingle now, but I won’t! It was the first deodorant I ever used, My mum favoured Odorono but I was sure Sno Mist was better (the gullibility of youth!). It was very sticky and after applying it you had to hold your arms up for about five minutes waiting for it to dry. Next, here are some forgotten foods. I say forgotten but when I am researching these things from the past I sometimes find that they still exist but in other countries. C and A’s for instance. It disappeared from the UK in 2001. The first time I saw it anywhere else (Prague, in this case) I was amazed! It was such a popular High Street store here for so many years I had always believed it to be British whereas it is in fact Dutch. I saw one in Berlin last week. I digress, back to food. Surprise peas were an alternative tinned or dried ones and they were supposed to be exactly like fresh garden peas. when very few homes had freezers, you either bought the pods (or grew them) or you used tinned or dried peas. Dried peas needed soaking overnight and when cooked were mushy. Surprise peas were freeze-dried and cooked in minutes. With the rise of the domestic freezer, they were eventually superseded. I have always loved crackers of any sort and one of my favourites were Macvita, now long gone. My grandmother used to buy them for me specially when we went to stay. My favourite biscuits were Milk and Honey – a sort of oval version of Jammy Dodgers. One year when I was about 14 I gave up biscuits for Lent. At the end of the six weeks I was more excited about tucking into some Milk and Honey biscuits than about my Easter egg. My mum used to buy Lemon Puffs from time to time. They were OK but when put in the biscuit tin they made the other biscuits go soggy and taste of lemon. When I was looking them up I found that they are still very popular in Sri Lanka. Here is a random selection of forgotten brands to finish off with. Curry’s still exist but look at what they sold then! My first bike was from Curry’s. Cheese triangles can still be bought but do you remember the flavoured ones? I was cleaning yesterday and, as I rummaged through my cleaning cupboard, looking through my vast array of sprays, wipes and cloths, it occurred to me that this is yet another way in which life has changed immeasurably since the 1950s. I’m calling this post ‘Keeping Clean’ because I’m looking at household products and toiletries. I have often mused on the fact that everything is branded nowadays. We don’t just have milk, distributed by our local farm or dairy. We have the choice of branded milks – Cravendale, Arla, Dairy Crest. Water doesn’t only come out of taps, we can choose Evian, Volvic, Buxton, etc etc. In my childhood, dusters, dishcloths and floor cloths were unbranded and bought in a local hardware shop. Dusters were always yellow and square, floor and dish cloths were white cotton and sold in a roll to be cut into handy lengths.In our house, floor cloths were always recycled old vests discarded by the family when too small or worn. Everyone wore vests then, they were always white cotton and made ideal cleaning cloths. We now have a bewildering assortment of wipes and cloths to choose from – J-cloths, many brands of sponge and microfibre cloths, and even branded dusters e.g Swiffer! Cleaning products tell the same story. In the very olden days, people used generic substances like carbolic soap, beeswax and bicarb. In the 1950s there were brands to choose from but far fewer than now. People had brand loyalty too. 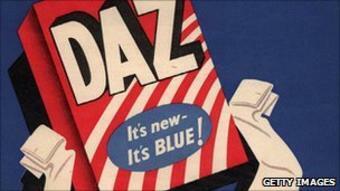 My Mum preferred Daz washing powder, other households used Omo or Persil. I remember Mansion Polish, too and Dura-Glit for cleaning brass. There was no fabric conditioner so, although I don’t remember thinking this at all, towels must have been hard and scratchy after being dried out on the line. In the world of toiletries, too, there were fewer brands. We always had Gibbs SR toothpaste and Lux soap, some preferred Imperial Leather, Pears, Colgate or, from the early 60s, Signal. What did the SR in Gibbs SR stand for, by the way? Dry skin was moisturised with Nivea or Ponds. There was no such thing as hair conditioner then and getting a comb or a brush through wet hair after washing was a nightmare, especially long or curly hair.